Karpman Consulting provides both public and private energy modeling and ASHRAE 90.1 trainings. We offer training at the beginner, intermediate, and advanced level, and have developed a comprehensive training curriculum designed to bring would-be modelers to proficiency. Our trainings have received overwhelmingly positive reviews and have been attended by over a thousand professionals. Our eQUEST modeling training include Modeling 201 and 202, which cover eQUEST modeling basics for existing buildings and new construction respectively and Modeling 301 and 302, which seek to develop intermediate and advanced modeling skills in attendees. 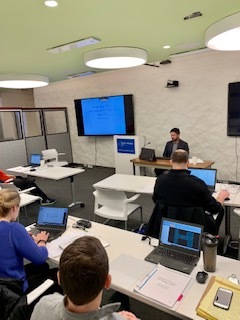 We also offer Modeling 101, which introduces building industry professionals to energy modeling, and Modeling 310, which covers differences between ASHRAE 90.1 2007, 2010, and 2013. Karpman Consulting performs energy analysis for LEED, incentive programs, tax credits, in support of energy audits, to support design, and in research settings. We have worked on a variety of building types and sizes, from garden-style multifamily complexes in New York and New Jersey to office towers in Copenhagen and Tokyo to hotels and institutional buildings. Our work has included modeling for code compliance following the Energy Cost Budget Method; modeling during conceptual and schematic design to inform early design decisions, such as HVAC system type selection; modeling for LEED, where some of our projects have earned the LEED Platinum rating; and modeling for incentive program participation, such as the New Jersey Pay for Performance Program and the NYSERDA New Construction Program. We are recognized leaders in the field, and leverage our experience conducting energy modeling training and advising incentive programs to the benefit of our clients. Karpman Consulting provides customized software and IT solutions for clients in the building energy efficiency industry. Our experience includes the design and development of an energy modeling tool for residential buildings; the design, development, and administration of a database application used to manage a multi-million dollar suite of energy efficiency incentive programs; the development of reporting templates and tools for a number of modeling based incentive programs; and the development of tools to facilitate model to bill calibration and post-retrofit savings verification. Our research project includes collaborating with partners and program such as NYSERDA and other state agencies, ASHRAE, Passive House, EPA Energy Star, Pacific Northwest National Laboratory, and more. Our research projects informed the development of codes and standards such as ASHRAE Standard 90.1 and NY Stretch Code Energy 2018, the modeling-based building rating systems such as ASHRAE bEQ and DOE Asset Score, and technical policies of large-scale whole building incentive programs.